“St. Vincent” is one of the nicest surprises of the year. It entertained me and left me with a feeling of satisfaction that’s all too rare these days. The story is best described as a comedy, but like many of the best films in that genre it’s rooted in truth: honest observations about family and friendship. I highly recommend it. The great Bill Murray can play “big” characters and he can be an everyman: here he’s completely convincing as an irresponsible Vietnam veteran who drinks and gambles too much. 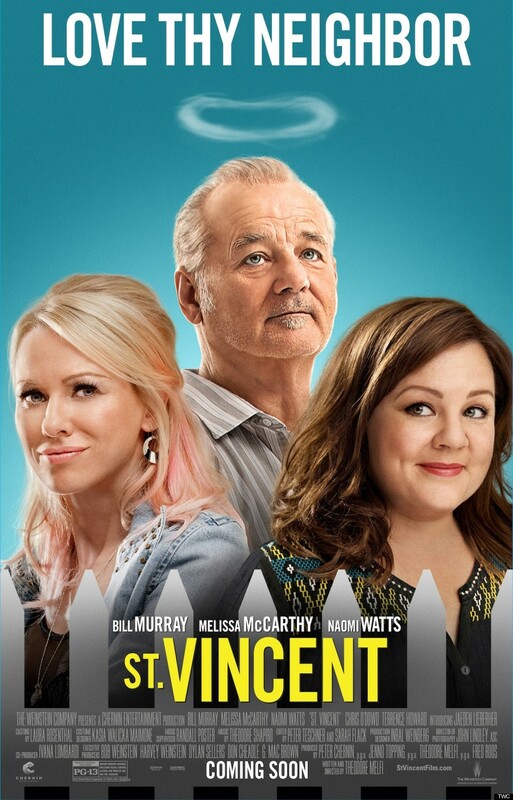 Melissa McCarthy plays a newly-single mom who moves next door with her young son (Jaeden Lieberher, a revelation) and ends up having to rely on Murray to babysit him after school every day. First time writer director Theodore Melfi fills these characters with three-dimensional qualities that give the movie its enormous appeal. A lot of other Hollywood films have tried to cover similar themes and most of them have failed. Yet “St. Vincent” gets it absolutely right. It turns the familiar into something bracingly fresh and funny. It makes you laugh, then breaks your heart. It’s funny, endearing, poignant, and above all, true. You won’t want to leave these characters behind.